This house once echoed to the works of Beethoven, played by the composer himself. You could say the same of many Viennese houses (he moved around a lot), but the Pasqualatihaus has a suite of memorial rooms you can visit. The house owner – Baron Pasqualati – was a friend and sponsor, and Beethoven lived in one of the apartments at various times between 1804 and 1814. What Beethoven did not do was live in the exact same rooms you can visit. 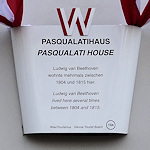 Manage your expectations – this is not a former apartment or a true Beethoven museum (that’s here and highly recommended), but a kind of small homage and memorial to the composer. The house is on a raised site above the old city walls, and would have looked down across the green suburbs of Vienna. It must have been an inspiring location. If you stand by the window, you can let your imagination roam to get a feel for the environment that Beethoven composed in. The five rooms you can visit are small and not furnished. In each, you’ll find a handful of items and displays relating to his life or work. But it’s very minimalist. There are only a couple of original Beethoven possessions – a salt and pepper pot for example, though that’s still kind of endearing to see. Otherwise, it’s pictures of performers and other contemporaries, opera flyers of the time, an oil portrait, a bust, and similar. Unfortunately, almost all display information is in German, so it’s hard to get much from it all unless you already know your Beethoven. I did enjoy seeing some sheet music with his corrections, but all inevitably copies of course (like nearly all the items on display). You can also listen to selected pieces at music desks with headphones. In summary – worth a visit if you’re tracing Beethoven’s footsteps across the city and immersing yourself in his life and works. Otherwise, it probably won’t feature at the top of your sightseeing list. At the time of writing, adult tickets were €5, with concessions available. The house was closed on Mondays and some public holidays, otherwise open from 10 am to 1 pm and again from 2 pm to 6 pm. Check the website for up-to-date information on opening times and prices. A Vienna Pass (see review) also covers the Pasqualatihaus. The house is just off the main Ring boulevard so quite central. Stand on the Ring at the monument to Johann Andreas von Liebenberg and look up and toward the city center – you’ll see it above you. It’s just a hop, skip and a jump from Schottentor station, which is on the U2 subway line and serves various tram (1, 37, 38, 40, 41, 42, 43, 44, 71, D) and bus lines (1A and 40A). When you leave Schottentor, head south along the ring on the city center side – it’s just around 200m away.